Ozu is a short ride from the coast of Shikoku. From route 56, I would recommend heading up route 24 in Ozu to reach the coast. It is a very nice flowing road that generally follows the river. Upon reaching the coast, I had two options; head west to a peninsula that runs along the Inland Sea and the Pacific Ocean, or head east towards Matsuyama. I had a full day ahead of me, so I decided to head west. Going west along route 378 and then route 197 will take you into the city of Ikata and then the port town of Misaki. Route 197 is a “Melody Line” that winds its way along the peninsula, cutting through the mountains. There are a couple of highway stations that offer very nice views of the Inland Sea and the Pacific Ocean. Other than that, there is nothing very special about this road. Looking at the coast, there is an interesting road that winds its way around the mountains instead of cutting through them. Unfortunately, I didn’t have much time to enjoy this. The main thing to see is a major wind farm. It is very hard to miss all the large windmills that generate a lot of power for the region. It does offer a couple of photo opportunities if you are interested. Once you reach the town of Misaki, you will realize how little there is to do. It is a fishing town that is used mainly to ferry people from Shikoku to Kyushu. On clear days, you can easily see Kyushu. If you have the time, you can also venture a little further to the tip of the peninsula, which has a large lighthouse. I didn’t bother to go, but I doubt it is very interesting. Upon returning, I would highly recommend the drive up the coast. To do this, you head the same way you started. You will see many small towns dotting the coast as you drive towards Matsuyama. There are various places to stop, let the children out, and play in a playground. However, it isn’t until you get to Futami, that there is anything to do. 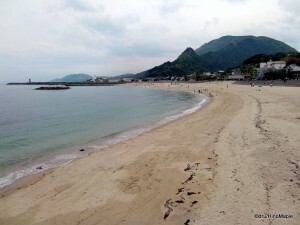 Futami has a famous beach where people from Matsuyama can enjoy as a daytrip. It is a very small beach artificial beach, but it is still beautiful. 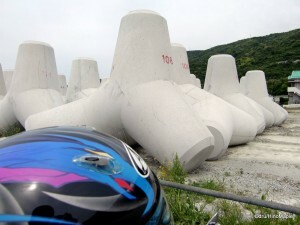 Unfortunately, it is lined with tetrapods to protect the sand from being washed out. This beach has a lot of things to see and do. The first thing you will notice is a large structure located in the middle of the beach. There is also a wedding arch that is usually standing. They try to promote beach weddings in Japan. Unfortunately, when I arrived, the wind knocked down the arch leaving a small mess. The buildings at the beach offer the usual souvenirs, but they also offer a couple works of art. The first is the Moai, mini replica statues of the Moai men from Easter Island. It is a very small piece of art that is easily missed. Most people tend to look out towards the beach and the Inland Sea, rather than the buildings. The other main piece of art is a replica of Stonehenge. This is located on the roof of the building, and very few people head up there. It is a very strange piece of art, but worth a quick look. The main thing to do is to just relax and enjoy the beach as much as you can. Bring a lunch, or wait in line for some of the barbequed food and your afternoon will be set. This entry was posted in Automobiles, Shikoku and tagged barbeque, beach, beach wedding, coast, Easter Island, Futami, Futami beach, highway station, Ikata, Inland Sea, Iyo, japan, kyushu, lighthouse, Matsuyama, Matsuyama-shi, melody line, Misaki, moai, moai men, Ozu, Pacific Ocean, Peninsula, playground, route 197, Route 24, route 56, Shikoku, Stonhenge, tetrapod, wedding, wind power, windmill, いかた, めろじーライン, フタミ, モアイ, 九州, 四国, 大洲, 日本, 松山 by Dru. Bookmark the permalink.